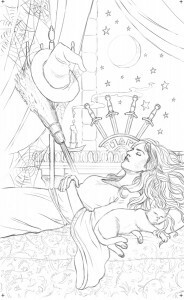 Exciting News – Tarot Deck! 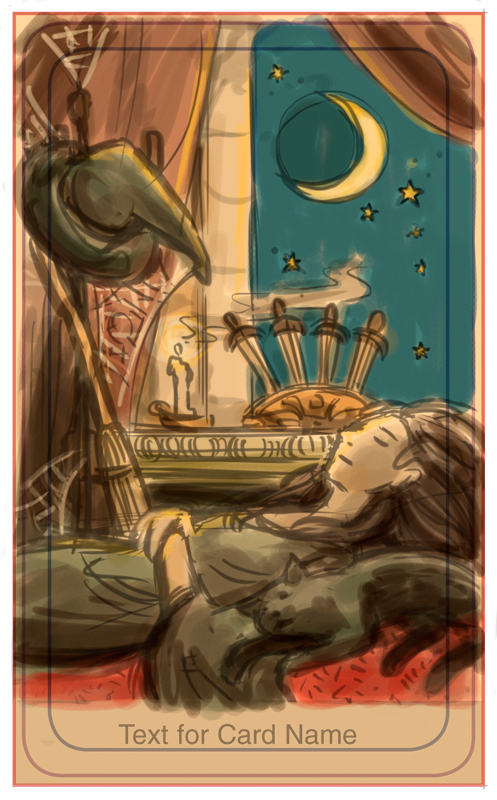 So now that the contract has been signed, I can share the exciting new project I have just begun – a full tarot deck! The deck, which will be published by Llewellyn Worldwide, maybe in late 2016 (it’s due in December 2015), will be authored by Deborah Blake. 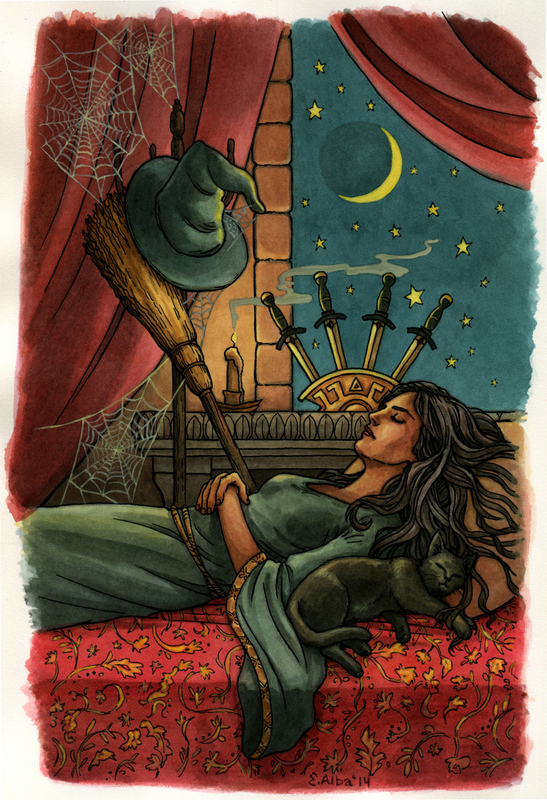 Deborah has published many books with Llewellyn, including The Witch’s Broom, which takes viewers on a “magickal flight into the history, tradition, and modern uses of broomsticks.” The style of our tarot deck is based loosely on the cover of that book, so we’ve been calling it “Retro Witch Tarot” as a working title. Deborah is also the author of The Baba Yaga series from Berkley Romance (Wickedly Magical, Wickedly Dangerous, Wickedly Wonderful). 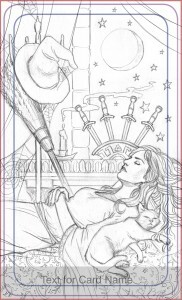 For those that don’t know, a tarot deck consists of 78 cards, and I will be illustrating ALL of them, including a back design. These cards consist of fifty-six Minor Arcana cards (four suits – swords, wands, cups, and pentacles), and twenty-two Major Arcana cards. 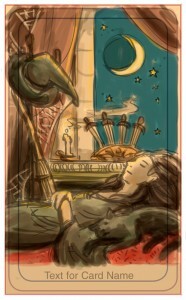 We are using the Rider-Waite tarot deck as a base. You can read more about this deck at http://en.wikipedia.org/wiki/Rider-Waite_tarot_deck, and also the history of tarot at http://en.wikipedia.org/wiki/Tarot. Deborah also wrote a great post about the reveal on her blog: http://deborahblake.blogspot.com/2014/09/the-super-sekrit-project-revealed.html! We’ll both be updating throughout the process, so be sure to check back at our blogs for updates! I will also be posting process pictures on my facebook page – https://www.facebook.com/albaillustration. To make sure I was the right artist for the job (and I am, thankfully! 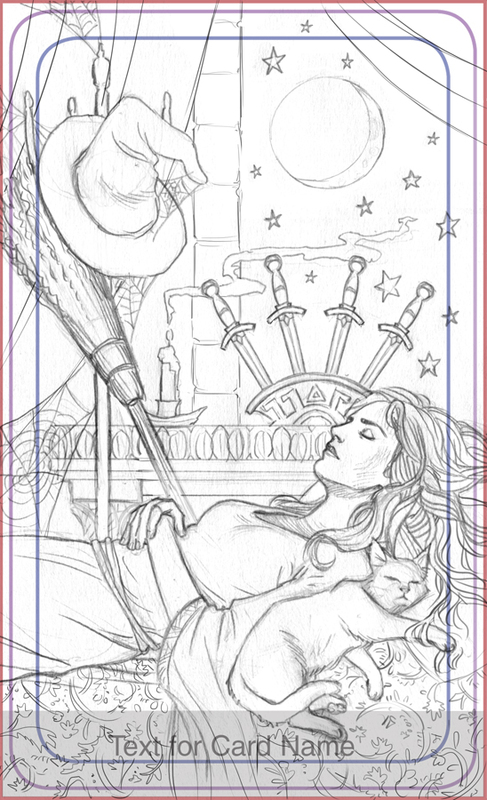 ), I first completed two sample cards – the Four of Swords and the Queen of Pentacles. Here they are! I also want to show a bit of my process for the images. I was told to look at Victorian Halloween cards as inspiration. 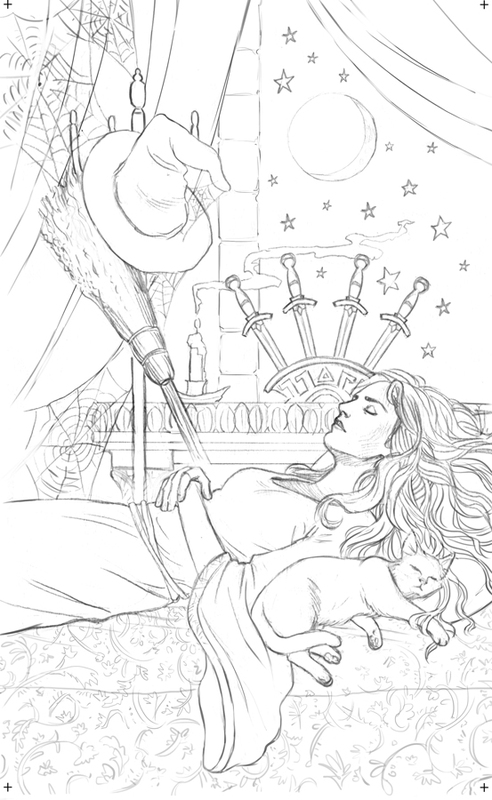 Much of the imagery is traditional – black hats, black cats, brooms… It’s going to be incredibly fun to work on! Here is my first more finished sketch. I had to adjust a few things after I sent them this for comments, including shrinking the image so that more fit within the crop and fixing the cat perspective and making sure none of the cat was cropped off by the bottom caption. And here is the finished drawing! I printed this lightly onto watercolor paper, inked it, and painted it! My paintings will all be around 6 x 10 inches in size. I am so thrilled to be working on this project and it couldn’t have come at a better time! I am now a full-time freelance illustrator, so I definitely felt better quitting my stable day job knowing I had such a huge project to keep me busy. 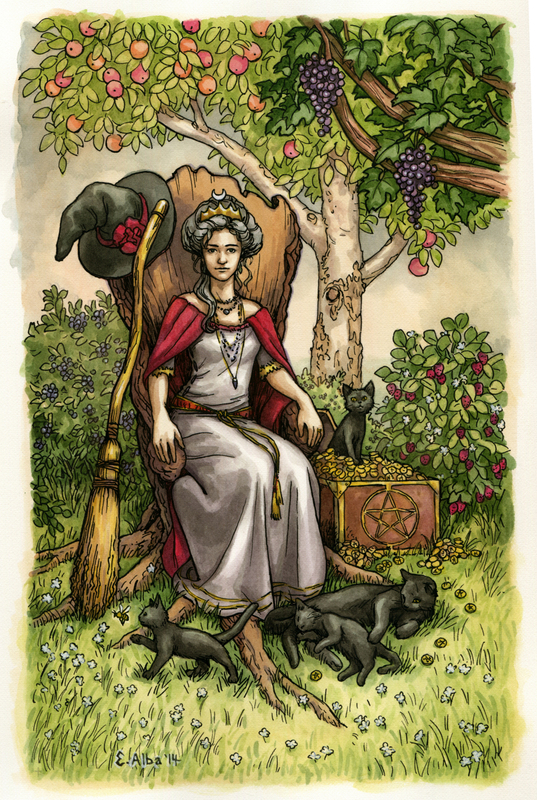 This entry was posted in announcements, artwork, tarot and tagged deborah blake, llewellyn worldwide, pen and ink, pentacles, rider-waite, swords, tarot, tarot deck, watercolor. Bookmark the permalink. 17 Responses to Exciting News – Tarot Deck! I am so excited to be working on this project with you, Elisabeth! I love watching you bring my descriptions to life. Your work is remarkable. Ahhh!!!! The waiting for this is torture! Is it too early to pre-order? What Sunwolf Said. Gorgeous images, gorgeous prose. I can’t wait to get a deck! What a cool project! Thank you for sharing the steps to your designs! I’m a working graphic designer/illustrator. I hope to one day freelance full-time as well. Your posts give me motivation to keep illustrating and networking. Thanks again for sharing! Hello! I don’t have a mailing list set up but I will be updating this blog with progress as well as on facebook and tumblr and wherever else I post! (: Thanks! Absolutely love the artwork! Can you please tell me what the name of this deck is? Thank you. Where can I purchase this deck?! Hi Danielle, the deck is available for pre-order on Amazon and on Llewellyn’s website! Hi. Can you tell me what the name of the deck is? Thank you!